The Disability History Daily Factoids are presented each weekday in October to celebrate "Persons with Disabilities History and Awareness Month" in Texas. HB 3616, passed during the 82nd Legislative session, encourages public schools and state agencies to celebrate the accomplishments of people with disabilities. Learn more about Disability History on our Website. Stevie Wonder (1950-present) is the stage name of Stevland Hardaway Morris, an American singer-songwriter, musician, producer, and activist. Wonder signed with a Motown record label at the age of eleven and continues to perform and record to this day. He became blind shortly after his birth. Wonder has recorded more than thirty U.S. top ten hits and has won twenty-two Grammy Awards, the most ever won by a male solo artist. He is also known for his work as an activist for political and social causes, including a campaign in 1980 to make Martin Luther King, Jr.'s birthday a national holiday. In 2008, Wonder was listed at number five on Billboard magazine's list of the Hot 100 All-Time Top Artists. Innovator, Activist, Author, Animal Scientist with Autism. Dr. Grandin (1947-present) is a designer of livestock handling facilities and a Professor of Animal Science at Colorado State University. Facilities she has designed are located in the United States, Canada, Europe, Mexico, Australia, New Zealand, and other countries. Almost half of all cattle handled in North America are handled in a center track restrainer system that she designed for meat plants. Curved chute and race systems she has designed for cattle are used worldwide and her writings on the flight zone and other principles of grazing animal behavior have helped many people to reduce stress on their animals during handling. Dr. Grandin obtained her B.A. at Franklin Pierce College and her M.S. in Animal Science at Arizona State University. Dr. Grandin received her Ph.D in Animal Science from the University of Illinois in 1989. Today she teaches courses on livestock behavior and facility design at Colorado State University and consults with the livestock industry on facility design, livestock handling, and animal welfare. She has appeared on television shows such as 20/20, 48 Hours, CNN Larry King Live, PrimeTime Live, the Today Show, and many shows in other countries. She has been featured in People Magazine, the New York Times, Forbes, U.S. News and World Report, Time Magazine, the New York Times book review, and Discover magazine. In 2010, Time Magazine named her one of the 100 most influential people. Interviews with Dr. Grandin have been broadcast on National Public Radio. She has also authored over 400 articles in both scientific journals and livestock periodicals on animal handling, welfare, and facility design. She is the author of "Thinking in Pictures," "Livestock Handling and Transport," "Genetics and the Behavior of Domestic Animals," and "Humane Livestock Handling." Her books "Animals in Translation" and "Animals Make Us Human" were both on the New York Times best seller list. "Animals Make Us Human" was also on the Canadian best seller list. Her life story has also been made into an HBO movie titled "Temple Grandin" and starring Claire Danes. The movie shows her life as a teenager and how she started her career. Thomas Hopkins Gallaudet (1787-1851) was a brilliant, Yale-educated minister and businessman. The course of his life changed when he met an 8-year-old girl, the child of a friend, who was deaf. He became deeply interested in the education of people with hearing impairments. He traveled to Europe to learn European educational techniques. Back in the United States, he founded a school known today as the American School for the Deaf, the first permanent school for people who were deaf in the United States. Gallaudet also brought the concept of today's American Sign Language back to the United States from Europe. Professor Lex Frieden is one of America's preeminent disability rights activists. Frieden became a quadriplegic after experiencing a spinal cord injury as a young man. Many universities were not open-minded about admitting students with disabilities at that time and Frieden faced architectural and attitudinal barriers. Still, he applied his natural aptitude for learning and excelled. He is now a Distinguished Alumnus of the University of Tulsa and holds a master's degree from the University of Houston. In 2004, he was awarded an honorary doctorate in law (LL.D.) by the National University of Ireland. After graduation, Professor Frieden became a leader of the independent living movement. He held many distinguished positions, including serving as the Executive Director of the National Council on Disability. In this position, Professor Frieden was instrumental in conceiving and drafting the Americans with Disabilities Act, the landmark civil rights legislation prohibiting discrimination against people with disabilities. Professor Frieden has received two Presidential Citations, commending his work in the field of disability rights, and has provided advice on the international stage, serving on a panel of experts for the United Nations. Today, Professor Frieden is Professor of Biomedical Informatics and Professor of Physical Medicine and Rehabilitation at the University of Texas Health Science Center at Houston, and he is Adjunct Professor of Physical Medicine and Rehabilitation at Baylor College of Medicine. Frieden also directs the ILRU - Independent Living Research Utilization Program at TIRR Memorial Hermann Hospital in Houston, Texas. ILRU is a research, training and technical assistance program on independent living for people with disabilities and seniors. TIRR is a comprehensive medical rehabilitation center which provides clinical, educational, and research programs pertaining to spinal cord and brain injuries and other disabling conditions. Professor Frieden continues to write, research, and teach. In April of 2011, the Texas Governor's Committee on People with Disabilities named its annual Employment Awards after Professor Frieden for his advocacy work regarding the employment of people with disabilities around the world. Professor Frieden has called Texas home for most of his adult life. Henry Louis "Lou" Gehrig (1903 - 1941) is remembered as a record-breaking professional baseball player who said a poignant farewell to the sport when he was diagnosed with a fatal illness. Gehrig played for the New York Yankees in a record-breaking 2,130 consecutive games, a record that stood for 56 years. He still holds the record for most career grand-slams. Gehrig was diagnosed with amyotrophic lateral sclerosis, today known as Lou Gehrig's disease, at the age of 36. Unable to continue to play due to his deteriorating condition, Gehrig said a heartfelt farewell to his fans and fellow players. On July 4, 1939, Lou Gehrig told a stadium of almost 62,000 fans, "Today I consider myself the luckiest guy on the face of the earth." Stephen William Hawking (1942-2018) was an British theoretical physicist and cosmologist, whose scientific books and public appearances made him an academic celebrity. He was considered one of the great minds of all time. He experienced paralysis due to a motor neuron disease that is related to amyotrophic lateral sclerosis. Hawking's key scientific works included providing, with Roger Penrose, theorems regarding gravitational singularities in the framework of general relativity, and the theoretical prediction that black holes should emit radiation, which is today known as Hawking radiation (or sometimes as Bekenstein-Hawking radiation). He also achieved success with works of popular science in which he discusses his own theories and cosmology in general; these include the runaway bestseller A Brief History of Time, which stayed on the British Sunday Times Bestseller List for a record-breaking 237 weeks. Hawking is an Honorary Fellow of the Royal Society of Arts, a lifetime member of the Pontifical Academy of Sciences, and in 2009 was awarded the Presidential Medal of Freedom, the highest civilian award in the United States. Hawking was the Lucasian Professor of Mathematics at the University of Cambridge for 30 years, taking up the post in 1979 and retiring in October of 2009. He then became Director of Research at the Centre for Theoretical Cosmology in the Department of Applied Mathematics and Theoretical Physics at the University of Cambridge. In April 2003, a group of Texans reached the base camp of Mount Everest. The team was comprised of people with diverse disabilities, including those with quadriplegia, paraplegia, and mobility, visual, and hearing impairments. The team made a 3-week trek to the 17,500 foot base camp of the world's highest peak, thus challenging misperceptions of people with disabilities as not capable. Later, Austin climber and expedition leader, Gary Guller, became the first man with one arm to reach Everest's peak. Lemon Jefferson (1893-1929) was a Texas blues singer and guitarist who was blind. He was one of the most popular blues singers of the 1920s and has been called "Father of the Texas Blues." Lemon Jefferson was born near Coutchman, Texas in Freestone County, near present-day Wortham, Texas. Jefferson's singing and self-accompaniment were distinctive as a result of his high-pitched voice and originality on the guitar. Blues and rock and roll musicians attempted to imitate both his songs and his musical style. His recordings would later influence such legends as B.B. King, T-Bone Walker, Lightnin' Hopkins, Canned Heat, Son House, and Robert Johnson. By the early 1910s, Jefferson began traveling frequently to Dallas, where he met and played with fellow blues musician Leadbelly. Jefferson was one of the earliest and most prominent figures in the blues movement that developed in the Deep Ellum area of Dallas. He was a founder of the Texas blues sound and an important influence on other blues singers and guitarists for generations to come. Samuel "Sam" Houston (1793-1863) is one of the most illustrious figures in Texas history. He was a leader of the Texas Revolution and served as the first and third President of the Republic of Texas. After Texas became part of the United States, Houston served as Governor. He is the only person in United States history to have served as the Governor of two states (Texas and Tennessee). Houston experienced bouts of depression throughout his life. Today the city of Houston bears his name. Helen Keller (1880-1968) worked for the American Foundation for the Blind for more than 40 years. Keller played a leading role in most of the significant political, social, and cultural movements of the 20th century. Throughout her lifetime she worked unceasingly to improve the lives of people with disabilities. The story of Helen Keller is the story of a child who suddenly lost her hearing and vision and at the age of 19 months, and who, with a great deal of persistence, grew into a highly intelligent and sensitive woman who wrote, spoke, and labored incessantly for the betterment of others. So powerful a symbol of triumph over adversity did she become that she has a definite place in the history of our time and of times to come. During her lifetime, Helen Keller received awards of great distinction too numerous to recount fully here. An entire room, called the Helen Keller Archives at the American Foundation for the Blind in New York City, is devoted to their preservation. These awards include Brazil's Order of the Southern Cross; Japan's Sacred Treasure; the Philippines' Golden Heart; Lebanon's Gold Medal of Merit; and her own country's highest honor, the Presidential Medal of Freedom. Most of these awards were bestowed on her in recognition of the stimulation her example and presence gave to work for people who were blind in those countries. In 1933 she was elected a member of the National Institute of Arts and Letters. During the Louis Braille Centennial Commemoration in 1952, Ms. Keller was made a Chevalier of the French Legion of Honor at a ceremony in the Sorbonne. In 1964 she received the Presidential Medal of Freedom from Lyndon Johnson. In 1965, she was one of 20 elected to the Women's Hall of Fame at the New York World's Fair. Franklin Delano Roosevelt (1882-1945), also known by his initials of FDR, was elected President of the United States four times. He is credited with helping to pull the country out of the Great Depression and leading the nation during World War II. While vacationing at Campobello Island, New Brunswick in the summer of 1921, Roosevelt contracted poliomyelitis (polio). Despite courageous efforts to overcome his illness, he never regained the use of his legs. In time, he established a foundation at Warm Springs, Georgia to help other people affected by polio, and inspired, as well as directed, the March of Dimes program that eventually funded an effective vaccine. For most of his public life, he was unable to move from the waist down. Roosevelt projected an image of power, security, and optimism during his time in the White House, famously declaring in his inaugural address: "The only thing we have to fear is fear itself." Stephen Hopkins (1707-1785) a person with cerebral palsy, was an American political leader from Rhode Island who signed the Declaration of Independence in 1776. Many medical historians believe his signature on the Declaration - second in size only to that of John Hancock - is evidence that he had a disabling condition believed to be cerebral palsy. Hopkins is known for saying, "my hands may tremble, my heart does not." He served as the Chief Justice and Governor of the English Colony of Rhode Island and Providence Plantations and was a Delegate to the Colonial Congress in Albany in 1754 and to the Continental Congress from 1774 to 1776. Hopkins was also the first chancellor of the College in the English Colony of Rhode Island and Providence Plantations (predecessor to Brown University) in conjunction with the presidency of the Baptist Reverend James Manning. Raymond "Ray" Kurzweil (1948-present) is an American author and inventor. His inventions and predictions about the future have both challenged and inspired. His technological contributions to the disability community include creating early "reading machines" that combined the advances in flat-bed scanning with text-to-speech synthesizers to create machines that could read content aloud to people with visual impairments. This invention led to a life-long friendship with musician Stevie Wonder. Thomas Alva Edison (1847-1931) was considered "slow" by his teachers due to learning disabilities and at age twelve was almost completely deafened by scarlet fever. Edison became an inventor, scientist, and businessman who developed many devices that greatly influenced life around the world, including the phonograph, the motion picture camera, and a long-lasting, practical electric light bulb. Dubbed "The Wizard of Menlo Park" by a newspaper reporter, he was one of the first inventors to apply the principles of mass production and large teamwork to the process of invention, and therefore is often credited with the creation of the first industrial research laboratory. Edison is the third most prolific inventor in history, holding 1,093 US patents, as well as many patents in the United Kingdom, France, and Germany. He is credited with numerous inventions that contributed to mass communication and, in particular, telecommunications. These inventions include a stock ticker, a mechanical vote recorder, a battery for an electric car, electrical power, recorded music, and motion pictures. His advanced work in these fields was an outgrowth of his early career as a telegraph operator. Edison originated the concept and implementation of electric-power generation and distribution to homes, businesses, and factories - a crucial development in the modern industrialized world. You can read this email because of Vinton Cerf, who created the first commercial email service to be connected to the Internet. Cerf, who is hearing impaired, has been called "one of the fathers of the Internet" for his pioneering work in computer science and information technology. He used early text messaging technologies to communicate with his wife, who is deaf. He said, "I have spent, as you can imagine, a fair chunk of my time trying to persuade people with hearing impairments to make use of electronic mail because I found it so powerful myself." Had it not been for Cerf's using text messaging to the extent he did, we may not have had integrated email as part of the functionality of the ARPAnet, the predecessor to the Internet. If you used a handheld calculator today, a thermal printer, or any device containing a microchip, you have Jack Kilby to thank. Kilby, a Texan, won the Nobel Prize for physics for helping to lead the way into the digital age. Kilby had a hearing impairment and before the inventions that made him famous, he helped to develop the transistor-based hearing aid. Modern data processing began with the inventions of American engineer, Herman Hollerith, a person with learning disabilities. Can a mining engineer who received poor grades in bookkeeping find success in the data processing industry? Herman Hollerith did--he invented the industry. Herman Hollerith (1860-1929), a person with learning disabilities, was an American statistician who developed a mechanical tabulator based on punched cards to rapidly tabulate statistics from millions of pieces of data. In 1890 he devised a punch card system to help tabulate the U.S. Census. He went on to found the Tabulating Machine Company which later became known as International Business Machines or IBM. For his tabulation machine he used the punch card invented in the early 1800s, by a French silk weaver called Joseph-Marie Jacquard. Jacquard invented a way of automatically controlling the warp and weft threads on a silk loom by recording patterns of holes in a string of cards. Hollerith's punch cards and tabulating machines were a step toward automated computation. His device could automatically read information which had been punched onto a card. Punch card technology was used in computers up until the late 1970s. Computer "punched cards" were read electronically; the cards moved between brass rods and the holes in the cards created an electric current where the rods would touch. You may have heard of the Criss Cole Rehabilitation Center in Austin, but did you know that it was named for a Texas soldier who was blinded in World War II? Criss Cole (1918-1985) was injured by a grenade during battle and lost his sight, an injury for which he was later awarded a Purple Heart. After his service in the war, Cole returned to Texas, where he completed his education, and became a lawyer and judge. He also became an influential legislator, helping to pass bills establishing Padre Island National Seashore and the University of Texas Institute of Texan Cultures at HemisFair in San Antonio. He was instrumental in passing a measure banning racial discrimination by state and local governments, and was involved with measures for redistricting, loan-company regulation, multiple use and pollution of Texas waters, and vocational rehabilitation. A compelling sculpture in front of the Criss Cole Rehabilitation Center by Texas sculptor Eugenie Kamrath Mygdal salutes Cole's model leadership of courage, perseverance, and accomplishment. In 1967, Barbara Jordan became the first African-American to serve in the Texas Senate since 1883, and in 1972 was elected President Pro Tempore. She coped routinely with the challenges presented by multiple sclerosis. Jordan became known for her distinct diction and forceful delivery on a wide range of subjects. In 1973, she became the first African-American woman from a Southern state to serve in the U.S. House of Representatives. Jordan delivered the keynote addresses at the 1976 and 1992 Democratic Conventions, emphasizing unity, equality, accountability, and American ideals. Retiring from Congress in 1979, she became a professor at the LBJ School of Public Affairs and became known as an outstanding educator. She is in the National Women's Hall of Fame and received the Presidential Medal of Freedom in 1994. In 1982, the Texas Governor's Committee on People with Disabilities created the Barbara Jordan Media Awards, a media relations program which includes a series of prestigious annual awards recognizing outstanding contributions by individuals and organizations of the communications media. In 1998, the Committee added a high school student subcategory to the competition in an effort to encourage and educate a new generation of journalists. Contributions are recognized for eliminating attitudinal, social, and physical barriers and encouraging accurate and progressive portrayals of people with disabilities. The Barbara Jordan Media Awards recognize representatives of the communications media in the fields of print, radio, television, Internet, advertising, photojournalism, public relations, books, and special contributions for increasing public understanding of the abilities and potential of people with disabilities. Clips of Barbara Jordan can be seen in the "The Scoop on Reporting about People with Disabilities"
Eight Texas counties are named in honor of distinguished Texans with disabilities. Deaf Smith County - Named for Erastus "Deaf" Smith (1787-1837), a scout during the Texas Revolution. Considered to be "the Bravest of the Brave" by Colonel William Travis, Smith destroyed Vince's Bridge during the Battle of San Jacinto, which prevented the retreat of the Mexican army and helped pave the way for Texas independence. Ector County - Named for General Matthew Duncan Ector (1822-1879), who had a below-the-knee amputation of his left leg at the Battle of Chickamauga in the Civil War. After the war, General Ector was elected to serve on the Texas Court of Appeals. Erath County - Named for state Senator George Bernard Erath (1813-1891), a former Texas Ranger and surveyor who surveyed the towns of Waco and Stephenville. Senator Erath, who became blind late in life, dictated his memoirs, which still serve as a valuable resource for early Texas history. Grayson County - Named for Peter Wagener Grayson (1788-1838), the first Attorney General of the Republic of Texas. Grayson, a person with mental illness, was a poet, diplomat, and a candidate for President of the Republic of Texas in 1838. Hood County - Named for General John Bell Hood (1831-1879), commander of the Texas Brigade. Hood lost the use of his left arm at the Battle of Gettysburg and had his right leg amputated later in the Civil War. Hood commanded the Army of Tennessee in the battles of Atlanta and Nashville. Fort Hood, a United States military post outside of Killeen, Texas, is named after him. Jones County - Named for Anson Jones (1798-1858), the last president of the Republic of Texas. Jones led the way for Texas to be annexed to the United States in 1845. Jones was injured in 1849 and lost the use of his left arm. He may also have experienced depression that caused him to commit suicide in 1858. Ward County - Named for Thomas William "Peg-Leg" Ward (1806-1872), who served as mayor of Austin and Commissioner of the General Land Office. Ward lost a leg to a cannonball during the Texas Revolution, and lost his right arm in 1841 when a cannon misfired at a San Jacinto Day celebration. Williamson County - Named for state Senator Robert McAlpin Williamson (1804-1859), a prominent early Texas lawyer and legislator. Senator Williamson's right leg was drawn back at the knee due to a childhood illness. He wore a wooden leg below his knee, giving him the nickname of "Three-Legged Willie." He was a delegate to the Texas Constitutional Convention, participated in the Battle of San Jacinto, and served in the Senate in both the Republic and the State of Texas. Texas owes its independence from Mexico to a person with a disability: Erastus "Deaf" Smith. He was a scout during the Texas Revolution and considered to be the "Bravest of the Brave" by Colonel William Travis, who in 1835 destroyed Vince's Bridge during the Battle of San Jacinto, which prevented the retreat of the Mexican army and helped pave the way for Texas' independence. Deaf Smith County is also named after Erastus Smith. In the painting "Surrender of Santa Anna," by William Henry Huddle http://www.tspb.state.tx.us/SPB/gallery/HisArt/02.htm, Erastus can be seen with his hand cupped behind his ear. Artist William Henry Huddle painted the scene of the morning of April 22, 1836, the day after Texas' victory over Mexico at the Battle of San Jacinto. Mexican General Antonio López de Santa Anna, in the uniform of a private soldier, was brought before Texas General Sam Houston as a prisoner of war. Houston, wounded in the battle, rested on a pallet under the oak tree while arranging an armistice with Santa Anna. To the right, seated on a log, was Erastus "Deaf" Smith, famous Texas scout; the captured Mexican battle flags were leaning nearby against the tree. To the left and rear of Houston was his Secretary of War, Thomas Jefferson Rusk, who was standing next to Colonel Mirabeau B. Lamar. Over thirty other historical figures were depicted in this painting. It has been on display in the first floor south wing of the Capitol since February 1891. 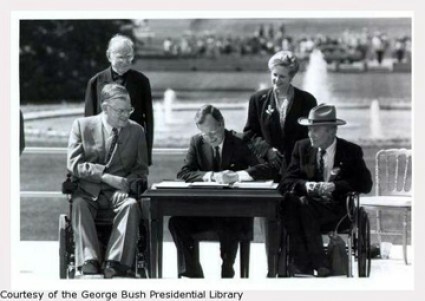 There were two Texans onstage at the historic signing of the Americans with Disabilities Act (ADA) in 1990. The first was President George H. W. Bush and the second was Justin Dart (1930-2002), a Texan advocate, known to many as the "Father of the ADA." Dart helped to create this landmark legislation, sometimes called an emancipation proclamation for people with disabilities, after a successful career in business. He led Tupperware Japan, where he focused on empowering female employees and employees with disabilities. Dart used a wheelchair for most of his life due to the effects of polio. In 1981, President Reagan appointed Dart to be the vice-chair of the National Council on Disability. From 1980 to 1985, Justin Dart was a member and then Chair of the Texas Governor's Committee on People with Disabilities. In 1998, Dart received the Presidential Medal of Freedom, the highest civilian honor, from President Clinton. In the image of the signing of the ADA below, Justin Dart is on the right, in the cowboy hat.